Design of surface function of nano carbon materials is one of hot issues in the materials science. Professor Ado Jorio is right hand person of Professor Dresselhaus (MIT) who is authority of nano-carbon science. He worked with her for development of new characterization technique of nano-carbon such as graphene and carbon nano-tube from 2000. From his many innovative characterization works using Raman spectroscopy and AFM observation, he showed amazing clear D band and G band energy density image using his unique nano-antenna device. It was really surprising image data and his data attracts much attention from floor. Many participants in this plenary talk were attracted by his exciting talk. Professor Elvira Fortunato is one of the pioneers in the field of paper electronics; her original work on paper electronics opened up new opportunities of the expansion of the areas to which we could apply otherwise difficult electronic devices. In developing such electronic devices, a key element is the establishment of low-temperature and solution-based technologies that enables to construct high-performance electronics such as thin film transistors. Professor Fortunato at the podium began her speech with some of the photos showing large-sized transparent OLED displays etc that clearly reflected growing thin film electronics market, and then continued to explain the importance of thin film electronics and how the devices have been developed. The main topics of the plenary lecture are some advances on solution-based metal oxide semiconductors (ex. ZnO- and In2O3-based oxides) and their application to electronic devices. Professor Fortunato explained the importance and usefulness of solution based-technology. Unlike conventional electronic device fabrication technologies that mostly rely on complex high vacuum equipment, the solution process has many advantages in terms of large-area deposition, roll-to-roll capability, easy control of composition, atmospheric processing, low cost, and so forth. The recent achievements by Professor Fortunato and her colleagues were then reviewed: they were successful in depositing solution-based InOx-based FETs at temperatures about 150 oC, and achieved a record high device mobility higher than 1 cm2/Vs. More importantly, the device performances were quite stable and reproducible. She also paid attention her focus on not only low-cost solution based-technology, but also on constituent materials to choose to fabricate the devices, that is, eco-friendly materials. In the lecture, she mentioned that we are in the 4th generation of the electronic devices in which multifunction devices are widely used, and that “more than Moore” would be expected in the 5th generation to come. Finally, she delivered a clear message to the audience that the solution-processed electronic device will play a pivotal role in the 5th generation. The symposium lasted for three days. On the first day, we had session on thin film and nano sheets fabricated by various methods. After the poster session (about 32 posters) for 2 hours, there was hydrothermal synthesis session. On the second day, we first concentrated on low-thermal-conductive and thermoelectric materials, materials design, YBCO and Perovskite related materials. Last session was on battery material. 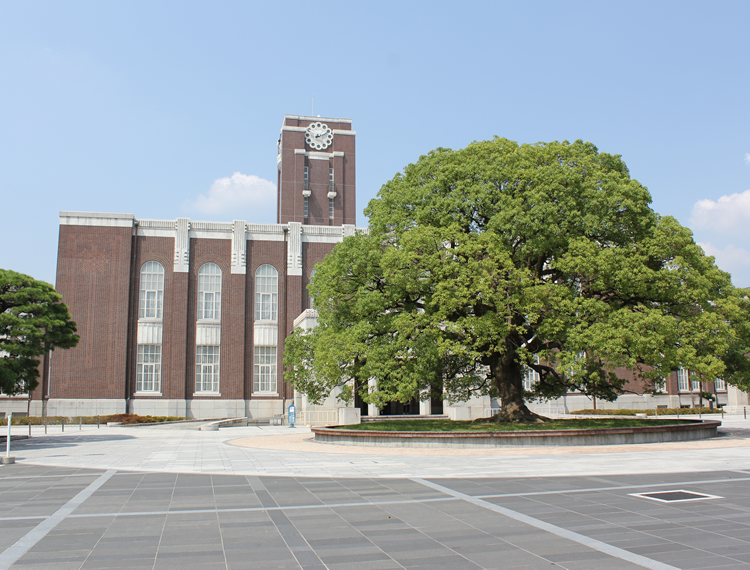 On the third day, photoelectrochemical and magnetic properties of various materials were discussed. One of the talks that attracted audience attention was on spinodal decomposition induced by magnetic field. We find that there are areas related to advanced ceramics and composites where we should work hard to maintain sustainable society. Prof Neophytou described his method to determine if nanostructures can improve Seebeck Coefficient. In the simple model of electron filtering there is actually no improvement. depending on lambda_E there can be a modest improvement. need quantum reflections not tunneling. Avoid ionized impurity scattering. dislocation networks can increase power factor. Teng Fang described computational efforts to find new p-type Half Heusler by looking for compounds with low effective mass. Calculations confirmed that 5d have lower effective mass than 4d transition metals. multiband effects are also calculated. Predicting RuTaSb as good TE materials. H.Takaki TE transport properties (thermal and electrical) of Magnetic Semiconductor CuFeS2 is calculated. Fe doping lowers lattice thermal conductivity. lattice thermal conductivity is larger along a-axis than c=axis. predicts more dilute doping would make better zT. 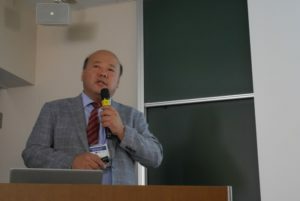 Eun Ha Choi of Kwangwoon University, Korea, gave an excellent keynote lecture in the oral session of Symposium C-5 in the morning session on September 1. 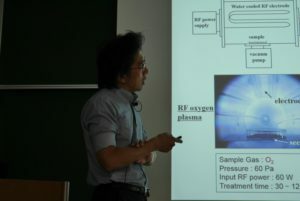 He first presented plasma devices used in Plasma Bioscience Research Center of Kwangwoon University, e.g., nonthermal biocompatible plasma (NBP) Jet, dielectric barrier discharge (DBD) systems, and nanosecond pulsed plasma systems. He introduced plasma diagnostics for NBP jet and DBD systems, and measured various kinds of plasma parameters, such as electron temperature, electron density, radical density, excited nitrogen density, electrical discharge energy, vibration temperature, rotation temperature, and so on. As plasma initiated ultraviolet photolysis and transport, he explained reactive oxygen species (ROS) generation mechanism in extracellular and intracellular region. He also reported that plasma with PEG-coated gold nanoparticles sensitize glioma, suppress cellular transformation by inhibiting growth and epithelial mesenchymal transition (EMT). Keynote lecture scene by Prof. Choi. Keynote lecture scene by Prof. Hayashi. In the opening talk prof. Sdyder of Northwestern University reviewed the role of Fermi Surface Complexity Factor for Thermoelectric Materials giving a wide number of examples and state of the art of experiments an band structure calculations. Prof. Oh of hanbat University (Korea) gave a complementary talk with instructive overview on Therthe effect of band structure modulation on thermoelectric properties. In his invited talk entitled “Novel nitride an oxide thin-film materials for thermoelectrics” Per Eklund (Linkoping University) reported about a ten-year investigation of ScN systems. While the nitride itself has a very good power factor, its thermal conductivity was too large to make its ZT acceptable. Adding Cr resulted in a significant reduction of κ. Further improvement of ZT could be achieved through a systematic investigation of transition metals capable of forming stable solid solutions with ScN (either ordered or disordered). A likely reduction of the thermal conductivity could also be achieved by generating (Ti, W)N-(Sc, Al)N superlattices, but the nanostructure was found to be stable only up to 950 °C, limiting its applicability. In the second part of his talk, Eklund discussed his research on Ca2Co4O9. Its laminar structure makes the material quite performing, and it was shown that thin films grown onto mica may be peeled off, leading to one of the few examples of flexible and self-sustaining inorganic thin films. Gao Min (Cardiff University) ended the session with a keynote entitled “A high-throughput approach towards accelerated discovery of promising thermoelectric materials” where combinatorial methods were applied to quicken the exploratory research on new thermoelectrics. He focused on binary (and ternary) alloys. The aim of the wok was to reduce the enormous number of possible AxBy compounds to be tested in the search for high ZT. Using very simple element characteristics such as electronegativity and atomic weight, radius, and number, he could show how efficient TE materials cluster together. Although the method does not aim at pointing out which binary compound might have large ZT, it enabled the experimental investigator to discard binary (and ternary) compounds which do not qualify as good thermoelectrics. His analysis was supported by experiments carried out by laser melting that enabled the fast synthesis and characterization of a large number of binary compounds. Prof. Mele of Muroran IT gave final remarks on the symposium A5 which was highly succesfull, with the highest number of presentations in the whole conference. All talks and posters were excellent and top-level research on thermoelectric was widely represented. Symposium A5 was enriched with AAT school (pre-event) and satellite workshop. There is strong intention to organize the thermoelectric symposium during IUMRS-ICAM 2019 in Nice. Kirill Kovnir from University of California (Now he moved to the Iowa State University) presented the design and realization of new caged compounds of Phosphide Thermoelectrics. The chemical way to design these new phosphide materials, the synthesis as well as their thermoelectric properties and the approach aimed for enhanced electrical properties were introduced in detail. Kirill Kovnir and his collaborators started their research in caged compounds of Ba8M16P30 (M=Cu and Au), which possessed a low lattice thermal conductivity of about 0.5 Wm-1K-1 or lower, a value very good for high thermoelectric performance. Further on, they continued to explore other caged compounds, such as BaNi2P4, SrNi2P4, Ba-Zn-Cu-P and Ba-Ge-Cu-P based system. The chemical bonds and coordination of elements are discussed in detail for more insight on the variation in thermoelectric properties. A high thermoelectric figure of merit of about 0.8 was achieved in the best compounds due to the improved electrical properties from chemical doping. Kunihiro Kihou from AIST, Japan and collaborators attempted to synthesize Zintle phase compound of K doped BaZn2As2 and investigated the thermoelectric properties. BaZn2As2 is the analogue of famous Zintl compound of CaAl2Sb2. This K doped BaZn2As2 compounds were prepared by the AIST tube method, which is suitable for handling materials with high reactivity. With the K doping, the resistivity and the Seebeck decreased, while the lattice thermal conductivity remained the similar value. Finally, the thermoelectric figure of merit ZT was increased from 0.2 to 0.7. This enhancement is mainly resulted from the much enhanced electrical properties. Professor Yuzuru MIYAZAKI from the Tohoku university, Japan and his colleagues have been studied the influence of the transition metal V, Cr, Fe, Co for the 3d serie, Nb, Mo, Ru and Rh for the 4d and Ta, W, Re and Ir for the 5d serie as Mn substitution in the Higher Manganese Silicide (Mn(1-x)Mx)4Si7 material. The DFT calculation allowed to determine a theoretical electrical conductivities and Seebeck to calculating the power factor and the anisotropic properties. The limitation of the substitution were also exposed for these elements which showed a very good substitution in the case of the Re elements in the structure. An increasing of the ZT from 0.2 to 0.4 was obtained with the Cr dopant. Iron substitution allows to modify the p or n type semiconducting nature of the material, HMS become n type when x is larger than 0.27. Ru dopant generates small separated domains rich and poor in Ru which decrease the power factor. Vanadium has been tested for x below 0.06 and has generated a structural modification which are visible by XRD technique. It’s impact the striation (presence of Mn1Si1 out of c axis) of the HMS phase. This striation vanishes after SPS processing. It generates a high variation of the electrical conductivity without any reduction of the Seebeck coefficient. In the case of Vanadium, a very good ZT value of 0.59 was obtained. Iron and vanadium co-doping has also been synthetized and showed a better thermoelectric properties with a maximum ZT value of 0.67. The last part of the talk was devoted to the strangest thermal HMS expansion due to striation and a variation of Mn/Si ratio. As conclusion, professor MIYAZAKI predicts the possibility to increase drastically the ZT coefficient of HMS thank the co doping and a good nanostructuration. The speaker Swapnil GHODKE and his colleagues have been tested the multidoping Re, W, Ta and Fe in the HMS structure in the aim to reduce the rare metal Re need quantity as dopant. They studied various W/Re/Ta ratio. All of the compositions are stables in temperature excepted for W which is limited to a temperature below 1000K. The thermal conductivity was measured thank AC calorimetry and showed a very low value of 1.2W/m/K. These results could be give a solution to reduce the Re using element for HMS doping with an increase in of the thermoelectric properties. Performance, stability and module integration of Higher Manganese Silicides materials solidified by Ribbon Growth on substrate RGS process (A5-O31-003). The Speaker Pierre-Yves PICHON and his colleagues have been studied the evolution of the Mn(Si99.55Al0.45)1.73 properties in temperature and cycling. The speaker showed a new planar geometry for TE device which has been tested with a thermal gradient applied thank a thermal radiation. The electrical properties were measured for a lot of cycles in temperature. A variation of electrical resistivity was measured in temperature but still constant in the time while the Seebeck coefficient was not clearly modified. The microstructural analysis showed cracks in the HMS material. The Mn/Si ratio of HMS phase evolves with the cycling time in the using temperature condition and leads to a segregation of Mn1Si1 phase at grains boundaries. As the result, the quantity of cracks increases with the cycling time in the Al doped HMS material. Meyya Meyyappan of NASA Ames Research Center, USA, gave a keynote lecture in the oral session of Symposium C-5 in the morning session on August 31. He presented an overview of his activities on the use of low temperature plasmas in the growth of nanomaterials and application development. First, he introduced the atmospheric pressure plasma jet developed as an alternative to inkjet printing to deposit nanomaterials on paper, plastic, metal foils and textiles to enable flexible, printable electronics. Examples of printing copper, silver, carbon nanotubes, zinc oxide and others on paper, cotton and plastics were discussed. Second, he emphasized that low temperature plasmas have been effective to grow carbon nanofibers and graphene of a variety of applications, and used them as nanoelectrodes arrays for biosensing applications. Finally, he showed vertical graphene or carbon nanowalls synthesized by PECVD, which have interesting properties. Christine Charles of Australian National University, Australia, gave a keynote lecture in the oral session of Symposium C-5 in the afternoon session on August 31. She presented that ‘CubeSat’ nano-satellites (based on the 10 cm by 10 cm by 10 cm modular unit) provided low-cost access to space and open doors to unprecedented unique projects accessible to universities and small companies. The process was facilitated by ongoing miniaturization at lower cost of electronics systems and components. ‘CubeSat’ was launched into space to study the ionosphere and the lower thermosphere, using a range of plasma sensors. In the miniaturized Pocket Rocket thruster, a radio frequency plasma is employed to heat the gas via charge exchange collisions and ambipolar flow to create a form of electrothermal thruster which has its heating mechanism in the center of the flowing propellant. 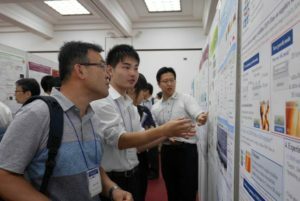 Poster session of Symposium C-5 was held in the evening on August 31. There were 23 poster presentations, and active discussion was held by the many participants. Poster presentation scene of Symposium C-5. The program started with an excellent keynote presentation by Mark S. Golden from the Van der Waals-Zeeman Institiute in Amsterdam, “Topological insulators and superconductors”. After a good introductory overview on topologically non-trivial states of matter, Mark presented their efforts in microfabricated structures of topological materials. Topological uperconductivity including interesting novel in-gap states were observed in superconductor/topological semi-metal Josephson junctions and the bulk properties of topological superconductors were addressed. The next talk by Alex Drozdov from the Max-Planck-Institute of Chemistry in Mainz covered one of the most exciting recent developments in the field of superconductivity in his talk “High temperature superconductivity in hydrides at high pressures” . Long believed to suffer from an upper boundary in the maximal superconducting transition temperature around 30K, phonon-mediated conventional BCS-superconductivity recently entered the stage of high temperature superconductivity. In metallic sulfur-hydride under extreme pressure, high electron phonon coupling coexists with high frequency phonons originating from hydrogen modes, leading to extremely high transition temperatures as predicted by Eliashberg theory. Their experimental effort showing the hallmarks of superconductivity above 200K include zero resistance, Meissner shielding, and an isotope effect, and make a compelling case for superconductivity. The session was continued by the talk titled “High Temperature Superconductivity of Highly Compressed Materials” given by Katsuya Shimizu. 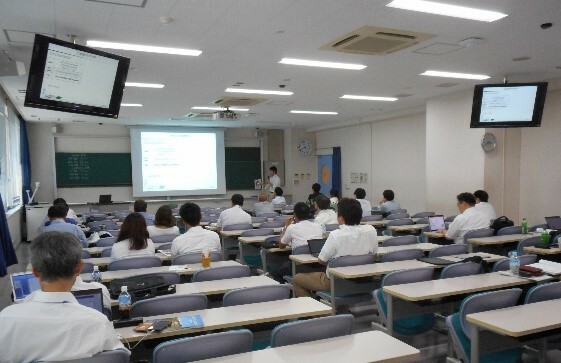 In the talk he reported his recent results on the structure of H3S under high pressure P = 100 – 200 GPa obtained by XRD. The collected x-ray diffraction data showed good agreement with the theoretically predicted structures of R3m and Im-3m4,5. No structural difference was observed between at 10 K and room temperature. Further he reviewed his work on Ca. In the next talk “Pairing mechanism of BiS2 superconductor: A first-principles study” Ryotaro Arita presented theoretical ab initio calculations of the critical temperature of novel BiS2-based layered superconductors, which are attracting broad interest. He described his new method of first principle calculation and showed that conventional phonon-mediated pairing cannot explain the high superconducting transition temperatures observed in this material. The last talk of the session titled “Emergent electronic phenomena in π-electron molecular systems” was given by Kosmas Prassides. The first part was devoted to the investigation of C60-based solids with stoichiometry A3C60 (A = alkali metal), which display the highest upper critical magnetic field (Hc2 > 90 T) among all known three-dimensional superconducting solids. The second part of the talk was devoted to synthesis of f ionic salts of polyaromatic hydrocarbon. Whereas Cs2(C14H10) is diamagnetic due to orbital polarization, Cs(C14H10) is a Heisenberg antiferromagnet with a gapped spin-liquid state emerging from the coupled highly frustrated Delta-chain magnetic topology of alternating-exchange spiral tubes of S = ½.